German Maestro GMP 240 review | What Hi-Fi? 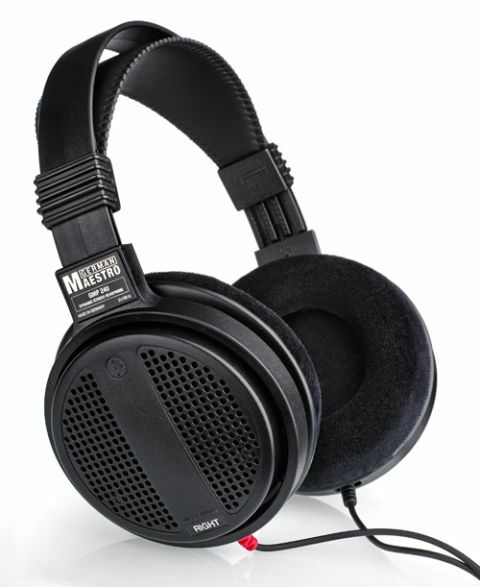 Take a glance at the German Maestro GMP 240 headphones and you’d be forgiven for thinking that the basic, heavy-duty build and design wouldn’t offer the most comfortable or engaging headphone experience. But the GMP 240s are light and flexible to wear and the leather headband sits nicely on your head. They may not be as luxurious as the Philips Fidelio X1s or Sennheiser HD 558s, but the velvet ear pads are soft and don’t make your ears hot. It’s not all good news when it comes to sound performance however – Aerosmith’s Pink highlights the GMP 240s chunky, slightly flabby bass that booms along and steamrollers the rest of the frequencies. We’d almost forgive this fault except that the midrange is pushed back: vocals are muffled and lack clarity. The GMP 240s don’t do any justice to Lorde’s incredible voice on Royals in our test. There’s a decent amount of space owing to the open-back design of the GMP 240s, but they’re not as airy as the Audio Technica ATH-AD700Xs. They also have a comparatively low sensitivity, so you’ll need to turn the volume up to get the full effect of the weighty sound. There may be warmth and heft to the GMP 240s, but it’s at the cost of clarity and timing. The funky beats and tempo of Stevie Wonder’s Superstition are lost due to the smoothed-out edges to the start and stop of notes. There’s also a hard edge to the treble, which shows up on any recordings with crisp production. The German Maestro GMP 240s may surprise you in terms of comfort, but they have better rivals in this price and category. The GMP 240s don’t have the insight or rhythmic ability of the Grado SR80is (£100), while the Sennheiser HD 558s (£130) deliver a smooth sound with bass and finesse. The GMP 240s are a decent pair of headphones, but if you really want to enjoy your music, we’d look elsewhere.